[A shadow is a dark area where light from a light source is blocked by an opaque object.] Shadows are mostly thought of as being two-dimensional areas of darkness brought about by the absence of illumination due to opaque objects that break the pathway of light. Like every creation of Allah (God), shadows not only serve a purpose for mankind, but also act as an evidence supporting the greatness of Allah (God). Shadow can be used as a gauge to find out the times of prayer. Before the invention of battery-operated clocks, people used sundials to tell time. 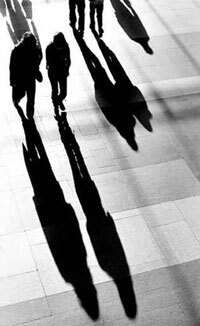 Shadows also provide shade in hot weathers. The word “prostration” has been used because the shadows usually fall upon the ground as do the human beings who prostrate. As numerous other verses of the Quran indicate, everything in creation glorifies Allah (God) and submits to His will. Therefore the shadow of a denier, no matter how unwilling he is, also prostrates to Allah (God), because the denier cannot pick his shadow up off the ground. The way the shadows extend and contract is actually done by Allah and not due to the absence or presence of light to a certain body. He (Allah) does it so perfectly that we tend to assume that to produce a shadow one needs the following three things: sunshine/light, an object to block the light, and a surface on which the shadow is cast. To further add prove that He (Allah) is the one controlling forms of the shadows; He informs us that if He wanted He could have made them stationary/still/calm/unruffled. If this phenomenon was to occur by Allah’s Permission; what do you think the scientists and everyone else will say? At any given time, one side of Earth is bathed in sunlight (the daytime) while the other side is in the shadow caused by Earth blocking the sunlight. Some problems in the world experiencing Daytime: I am moving but my shadow is still in the same place and the same size. It’s not just my shadow but every shadow is stuck in its place!?! Some problems in the world experiencing Nighttime: Night is not going away. Even when this side of the earth is bathed in sunlight or even if we put on our artificial lights; the shadow is not even being disturbed. But wait; we can’t even see because of the Darkness; we have to migrate to the other side of the earth which has light but wait; while the sun was on our side it must have been dark on that other side that had sunlight. Now the shadow is surrounding the whole earth regardless of the existence of the sun. Everything is perishing slowly; What do we do? It’s like we are in a dark room which is obviously dark and even if light was put in the room; it would not be able to overpower the shadow/darkness which Allah has made stationary/unruffled. Out of all our senses we for sure can’t see in this kind of scenario; we can only hear. All right; first we have to thank Allah that He did not make the shadow stationary/still/calm/unruffled. We have to remember that the shadows prostrate to Allah and hence the fact that they are moving the way they should is because they haven’t disobeyed Allah. Second we have to realize that the sun has been chosen to be used to determine time.